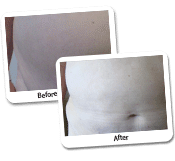 Could Tumescent Liposuction Be Beneficial to You? Discover a Case Study Below! Liposuction is not the only way to deal with obesity, but it can give you a head start in your diet. It also has the ability to remove fat deposits that cannot be removed by diet and exercise alone, for example fat deposits in areas of the body that are difficult to exercise. To find out what liposuction could possibly do for you, and if it is the answer to your particular problem, please examine the case study and the additional information below. Liposuction is a popular cosmetic procedure used to remove unwanted or harmful fat from certain parts of the body. It may involve removing small areas of fat that could not be treated with exercise or diet, but also large areas of fat on the buttocks, hips, thighs and tummy. The aim of this cosmetic procedure is reshaping the body. Liposuction can provide patients with a long-term result as long as they maintain a healthy weight and have a balanced diet. Tumescent liposuction is a liposuction procedure that is performed with the tumescent technique. During a tumescent lipo procedure, Dr Lanzer will use a local anaesthetic. 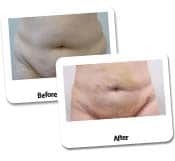 The local anaesthetic used during a tumescent lipo procedure is usually a large volume of dilute lidocaine and epinephrine, which is injected into the subcutaneous fat. By injecting this combination of lidocaine and epinephrine, the subcutaneous fat becomes tumescent (swollen and firm), hence the name of the procedure. By altering the characteristics of the fat that needs to be removed, Dr Lanzer is able to remove the fat a lot easier. Tumescent liposuction is currently one of the most advanced cosmetic surgical procedures. The local anaesthetics used during a tumescent lipo procedure eliminates the need for intravenous sedatives and general anaesthetic. The epinephrine used in the local anaesthetic also reduces bleeding during and after the operation, which leads to less bruising and a quicker recovery time. What Can I Expect During a Lipo Procedure? During the lipo procedure, Dr Lanzer will inject the treatment area with the anaesthetic solution. This anaesthetic solution is meant to reduce the loss of blood, bruising and swelling. These qualities greatly reduce the risk during such a procedure, but also significantly decrease the post-operative recovery time of the patient in question. When the anaesthetic solution has been injected into the treatment area, Dr Lanzer will start to break up the fat cells by using high frequency vibrations. These vibrations make the fat easier to remove and reduce the chances of damage to any surrounding tissues. When the fat has been broken up, Dr Lanzer will make a small incision near the treatment area and insert a suction tube. This suction tube will be attached to a vacuum machine. 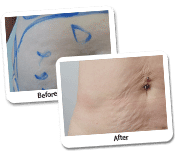 In most cases, only one incision is needed to remove the fat from the desired area. However, if the treatment area is of a considerable size, Dr Lanzer may need to make more than one incision to remove the fat from the desired area. When the suction tube is in place, Dr Lanzer will move the suction tube back and forth to loosen the fat up further and to remove it from the treatment area. Once all the fat has been removed, Dr Lanzer will drain any excess fluids. Then, the treated area will be stitched up and bandaged. 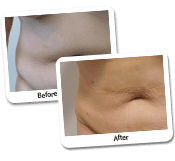 In general, a lipo procedure can take between one to three hours. However, these times may vary according to the size of the treatment area and the location of the treatment area. What Can I Expect After a Lipo Procedure? Since the arrival of the tumescent liposuction procedure, recovery time has reduced greatly. Immediately after the procedure, the patient often has to wear an elasticated support corset or a compression bandage depending on the treated area. This elasticated support corset or compression bandage may have to be worn for several weeks after the operation. Most patients will also be required to take antibiotics after the procedure. Antibiotics are prescribed to reduce the chance of infection. During this time, it is recommended not to smoke, given the fact that smoking can increase the chance of infection and slow down your recovery time. The majority of patients experience some minor bruising and swelling of the treated area after the operation. If the patient experiences any post-operative discomfort, the patient may take some over-the-counter painkillers. However, before you decide to take any additional medication, please contact the Dr Lanzer clinic to check if the medications in question are safe to use. Downtime varies from patient to patient, since there are a number of denominators that can affect your recovery time. One of these denominators is the size of the treatment area. If the treatment area is considerably large, you may have more downtime than a patient who only had a small area treated. After the operation, patients should avoid any strenuous activities up to four weeks. Patients can do general movements and some light walking, as long as no excess strain is put on the treated area. More information regarding recovery and downtime will be given in the treatment plan before the operation takes place. This way, patients know exactly what to expect and are unlikely to encounter any unwanted surprises along the way. Patients who are considering a tumescent lipo procedure, or would like to see if they are eligible for this procedure, are free to contact the Dr Lanzer Clinic for more information. Our friendly staff and Dr Lanzer will be more than happy to assist you. Mega liposuction could be a treatment for patients with a considerable amount of weight to lose, although it is not a weight loss treatment. The purpose of the mega liposuction is to provide a patient with a head start in their lifestyle change, while also removing some of the fat deposits that can make exercise difficult. In the case of the patient above, the overhang of the abdomen could have made certain exercises difficult to execute. The removal of this fat gives the patient more options where exercise is concerned, but the patient must maintain a healthy lifestyle after the procedure to reach their target weight. Reaching your ideal weight is possible through a combination of exercise and diet. By eating healthier and exercising regularly, you can effectively burn more calories than you consume. As a result, you will start to lose weight. Of course, weight loss is more difficult for some patients than others, so it is always recommended to find some assistance with a nutritionist or a personal trainer, who can create an appropriate diet and exercise plan for you. Alternatively, you can also seek additional advice with your local doctor, who can keep an eye on your weight loss efforts after a mega liposuction.